LATICRETE introduces STONETECHⓇ Quartz & Porcelain Tile Sealer and STONETECH Quartz & Tile Cleaner to easily maintain the natural look of interior and exterior quartz, engineered stone and tile surfaces. LATICRETE is one of the first companies in the building materials industry to address the growing trend of engineered stone as an alternative to natural stone by offering a complete care and maintenance system for engineered quartz and tile. STONETECH Quartz & Porcelain Tile Sealer is a premium water-based sealer that acts as a preventive against oil and water-based stains. For daily maintenance, STONETECH Quartz & Tile Cleaner is recommended to gently clean dust, dirt, spills and light stains. “Engineered stone is increasingly becoming an alternative to natural stone due to marketed benefits of low maintenance. However, not all engineered stone is made the same, so proper care and maintenance cannot be overlooked. STONETECH Quartz & Porcelain Tile Sealer and daily maintenance with STONETECH Quartz & Tile Cleaner can aid in preserving the original appearance,” said LATICRETE Product Manager Diane Phelan. In addition to protecting engineered quartz, stone and tile surfaces, STONETECH Quartz & Porcelain Tile Sealer can also be used as a pre-grout sealer to prevent potential staining on porcelain tile. This water-based product is low odor, non-flammable and meets state and federal VOC requirements, making it safer for installers to work with and more environmentally friendly than solvent-based sealers. 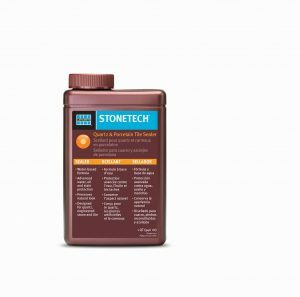 STONETECH Quartz & Tile Cleaner is a premium, water-based solution that is gentle and effective enough to clean and remove light stains without harsh chemicals that can harm or dull the surface. The easy-to-use product gives off a clean, fresh scent and does not require any dilution. After spraying STONETECH Quartz & Tile Cleaner directly on the surface, the mess can be wiped away without the need to rinse with water. STONETECH Quartz & Porcelain Tile Sealer is available in a 32 oz (946 ml) bottle that can cover up to 225 square feet (20.9 square meters). STONETECH Quartz & Tile Cleaner is available in a 24 fl oz (709 ml) spray bottle.